No rest for the wicked it seemed as we were up before the sunrise as we had been the entire trip thus far. After finding the hostels owner we left our home for the last 2 days, the El Champal de Cocachacra and began the predawn trip down the mountain to Chosica at 545. Having figured out confusing streets of downtown Chosica the night before we had a little easier time making our way to the FCCA depot arriving just after 6:30. We left our car at the station so the hired driver could pick us up later that evening and then went to check in for the days trip. 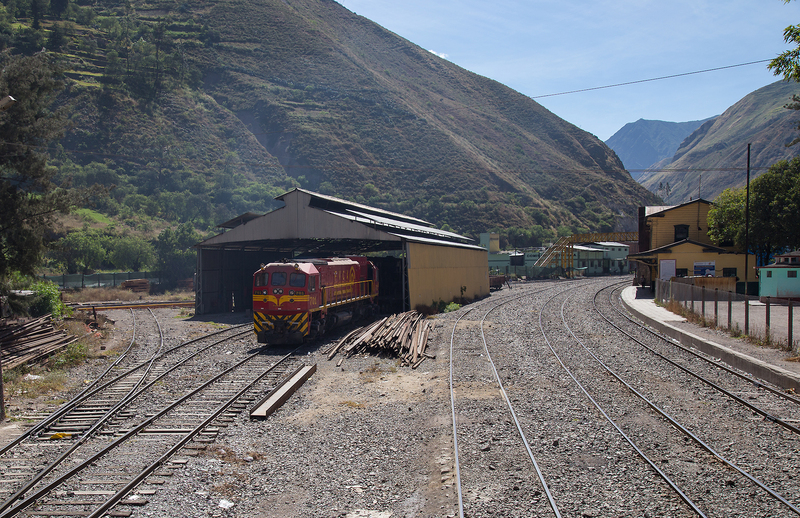 We were directed to our ride for the day, big red 1027, former NS C39-8 8627 which had been heavily modified in the FCCA shops here in Chosica to fit through the tunnels on the highest part of the line. We walked across the yard to begin what would be a very long but unforgettable day. For those unfamiliar with the FCCA I have provided a map with this part of the line highlighted below for context. 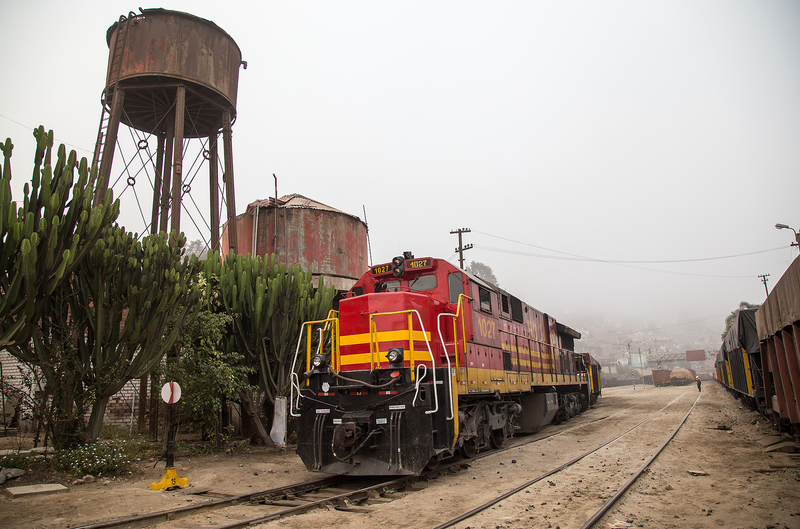 Remnants of the steam era and some desert flora make for an interesting backdrop as 1027 switches out its train. FCCA 8627 in its former life leading a NS train through Howell Wye just miles from where I live in Atlanta. Strange that I had to travel all the way to Peru to see it several years later. Thanks to Patrick Phelan for the photo. Our maquenista (engineer) Mr. Sulvlo Mora poses for the camera as we wait to depart. A wider view of the dusty yard, the sand is from both the flood and the naturally dusty environment in this coastal desert where it almost never rains. The typically Lima fog still hangs over the yard at this early hour. At 8:07 AM the big GE dug in and we began our trip up the mountain. 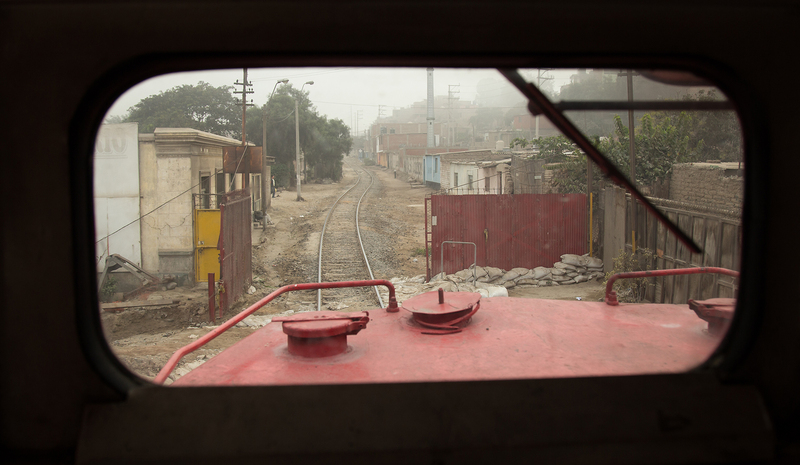 The first part of the journey was not overly spectacular as we climbed through the busy outskirts of Chosica with the coastal fog still thick, the train passed right through the middle of rows of houses and the horn blared constantly to warn off people, cars and animals from the track. Below is a video which covers our journey up to Matucana. Unfortunately the camera worked perfectly fine during the less interesting parts of the journey but had recording issues that I would not figure out how to solve until after missing several very scenic parts of the trip. More links will be provided to skip to certain parts of the video throughout this post. 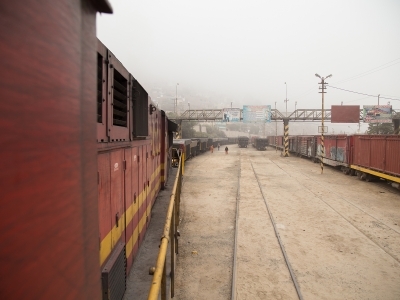 Leaving the yard in Chosica. Theft is a major problem and all yards are gated and guarded by a private security company. 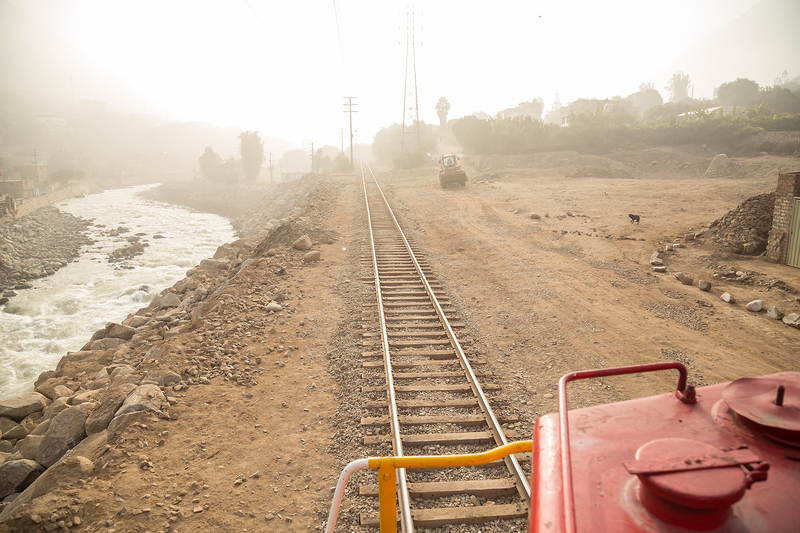 As we rolled north out of Chosica the tracks ran alongside the Rimac River. The damage from the floods in late 2017 were still very visible. 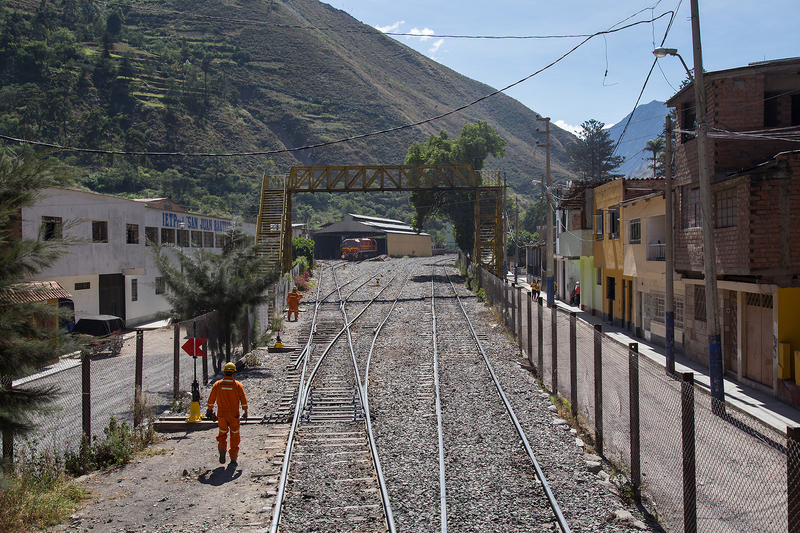 The tracks had been destroyed in dozens of location by the raging river but amazingly FCCA had them fully operational in less than 3 weeks. Our maquenista Senor Sulvlo Mora keeps a close watch on the tracks ahead as we proceed through the busy outskirts of Chosica. 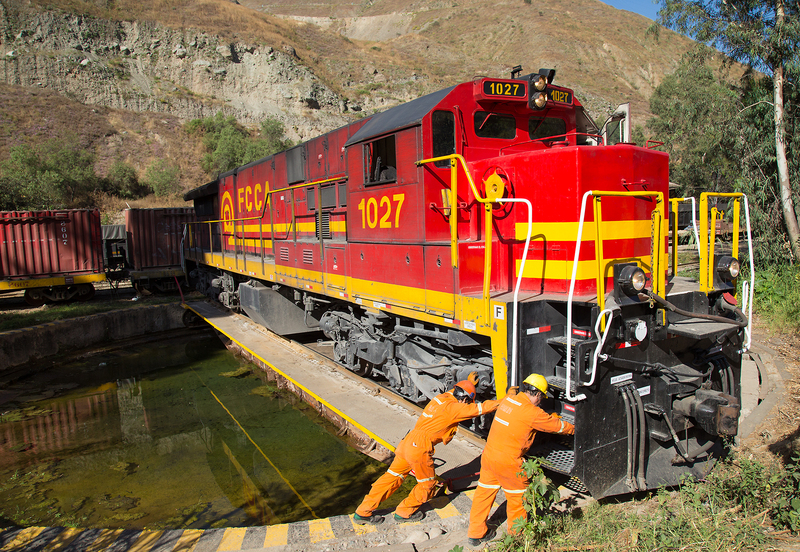 Car-train collisions are unfortunately common here and our engineers hand is on the straight air brake valve to stop the train quick in the case of an accident. 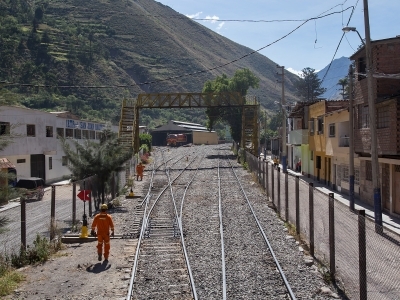 The trains hefe and brakero (conductor and brakeman) line our train into the yard at San Bartolome. 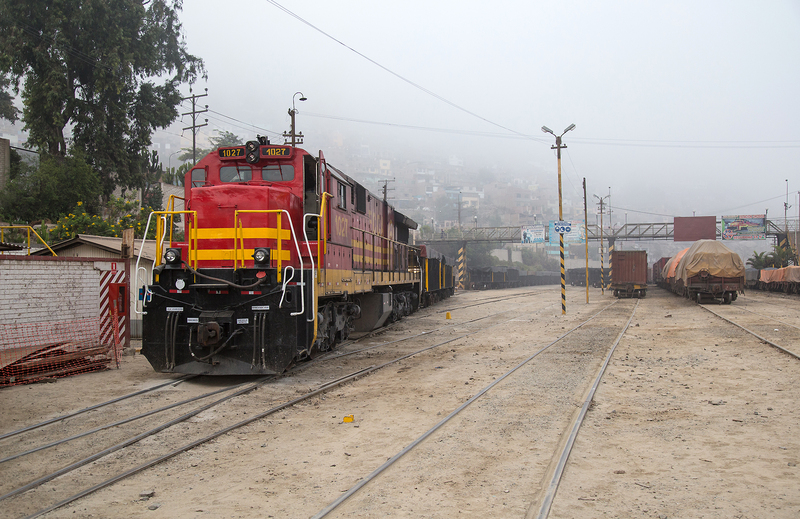 A number of our of service locomotives sit on the siding, more photos of them in a later post. 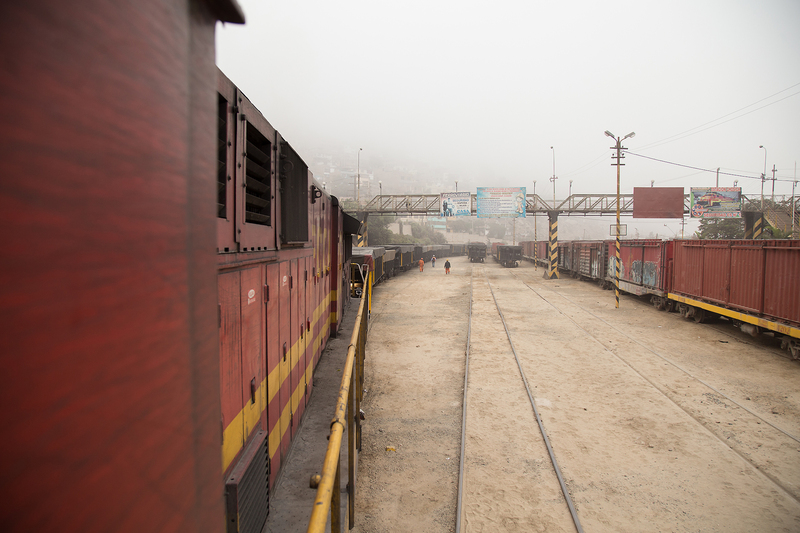 The yard is compact and it can get very crowded when two trains need to meet here as we would experience the next day. 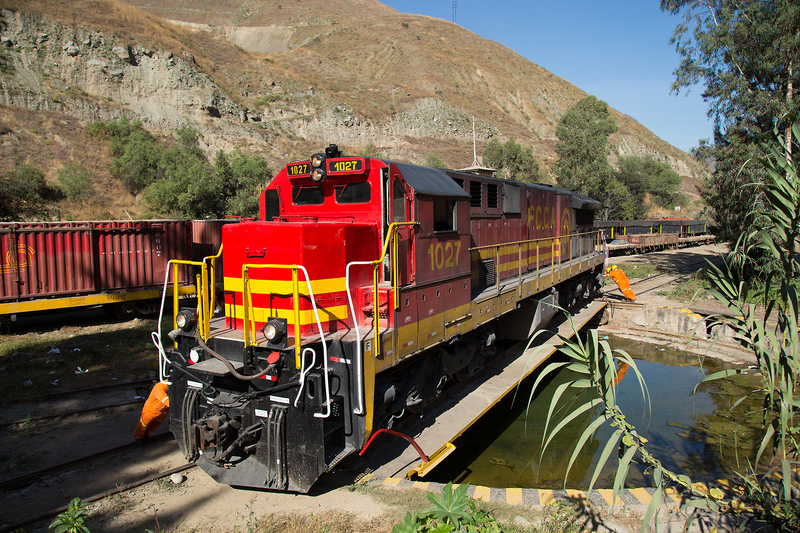 FCCA 1027 takes a spin around the famous turntable in San Bartolome. A small stream flows through the yard and the turntable is always filled with water, there are even fish living in it! All turntables on the FCCA area manually operated and our whole traincrew helps out to spin the locomotive around the turntable. Despite the manual labor required the locomotive was turned with incredible speed, faster than most automatic turntables in the US! A view looking south from the turntable lead. A Maintanence of Way speeder has just left the yard after waiting for our train. After running through the crossovers to return to our train we will head up the steeply graded track to the left. Approaching the town of San Bartolome proper. 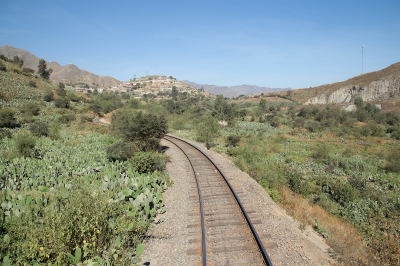 The fields are full of cacti, a common crop along this part of the line. 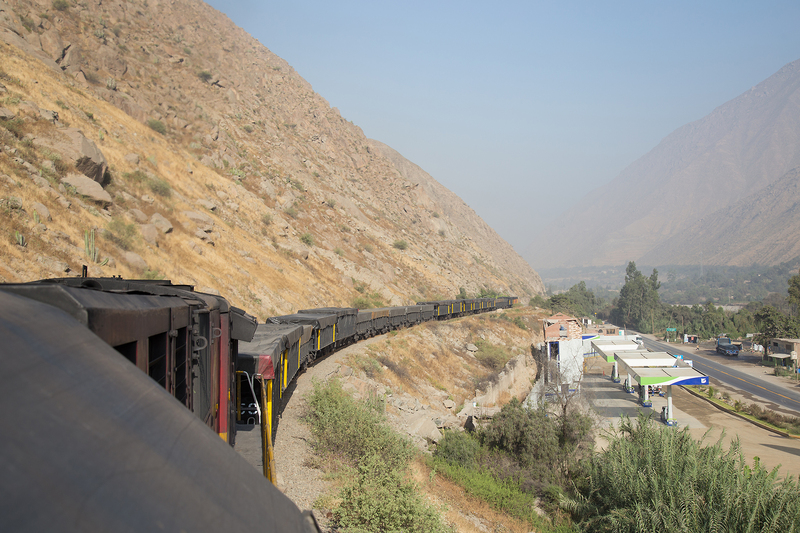 Climbing around the horseshoe curves out of San Bartolomo, we have left the dusty fog of Lima behind and its a beautiful day as we climb into the mountains. 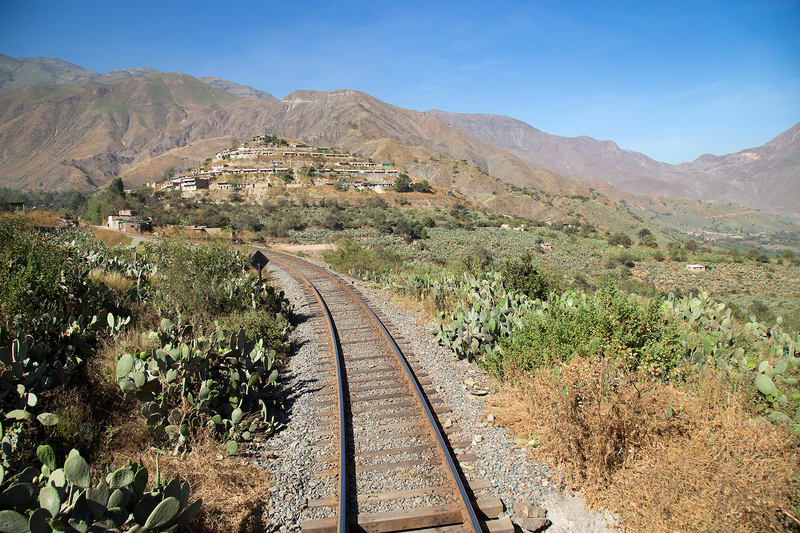 All 3 levels of the San Bartolomo switchbacks are visible as we climb out of town, it is the first of several such views we will see on our journey. 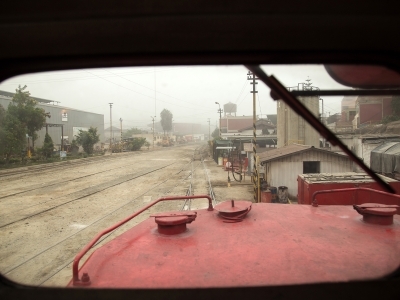 At KM 91 we reach the small yard of Balta, this yard is primarily used as overflow capacity for Matucana. 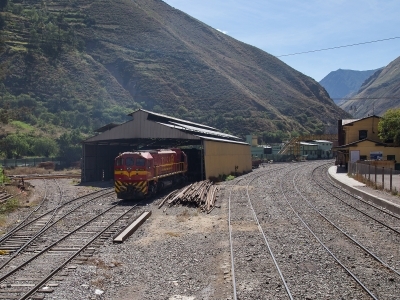 Often trains will tie down here awaiting a new crew, in other cases trains will run south out of Matucana to leave cars and then run engine light back. 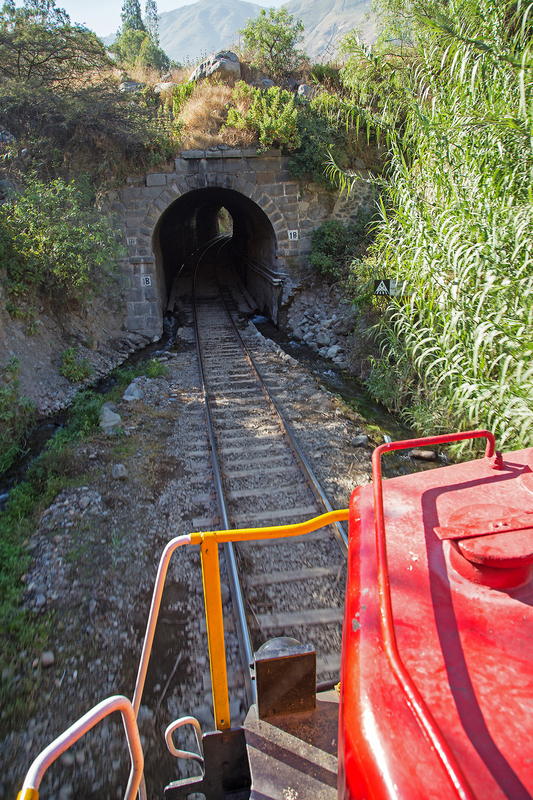 Just past the yard is the Balta spiral tunnel, one of the newest features on the line. 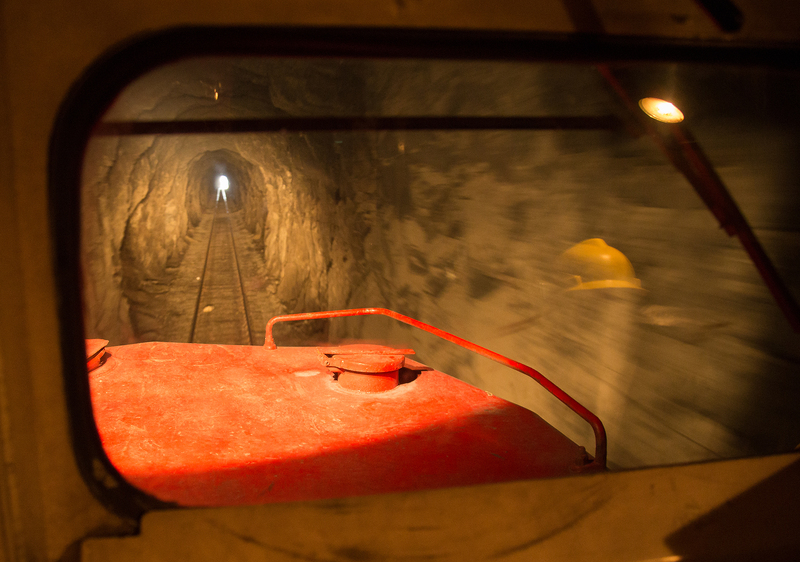 The tunnel was built in the 1980s to replace a broad horseshoe curve that was repeatedly destroyed by floods. 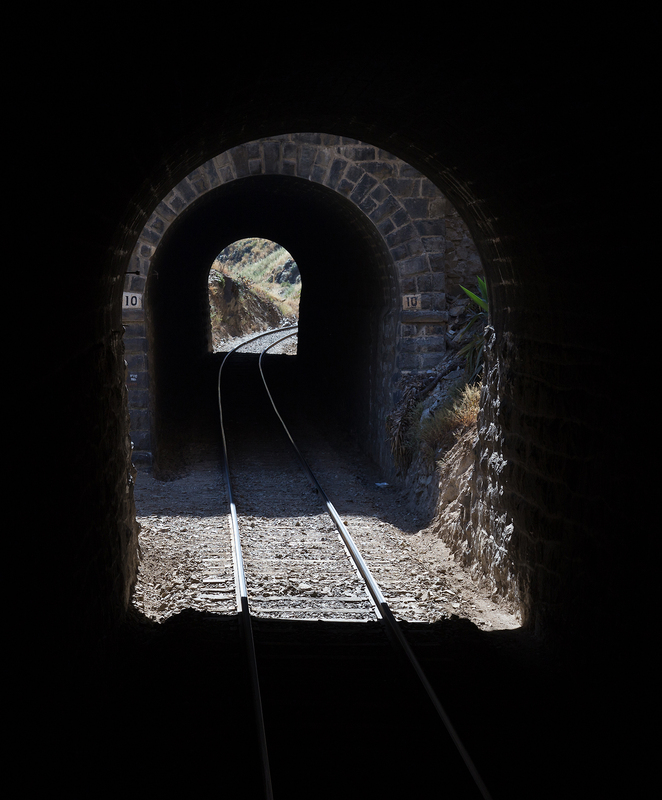 Once the line exits the tunnel it will climb even further on a horseshoe curve gaining several hundred feet in a very short distance. Passing former KCS SD40T-2 1024 leading a southbound train at Balta, the sign to the left warns the crew to whistle for the Balta tunnel. The small structure houses security staff who keep watch at this lonely outpost day in and day out. Inside the Balta Spiral tunnel, the first part of the loop is ahead. After exiting the spiral tunnel tunnel the yard is visible below, ahead is the big horseshoe curve and in a few minutes we will be passing the same spot again at an even higher elevation. On the third level and once again heading in the right direction with the two lower levels visible. Traces of the old line can be seen if one looks closely along the river. Out of tunnel 9 and straight into 10! 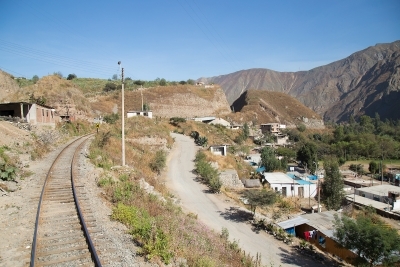 At KM 102 we arrive in Matucana, past here the line will become even more spectacular and we will climb 4 switchbacks between here and Galera. Trains with unmodified locomotives will stop here to swap locomotives but since our locomotive has been modified we will go straight through after waiting for an opposing southbound train and setting off a few cars as we are too long to fit on the switchbacks. 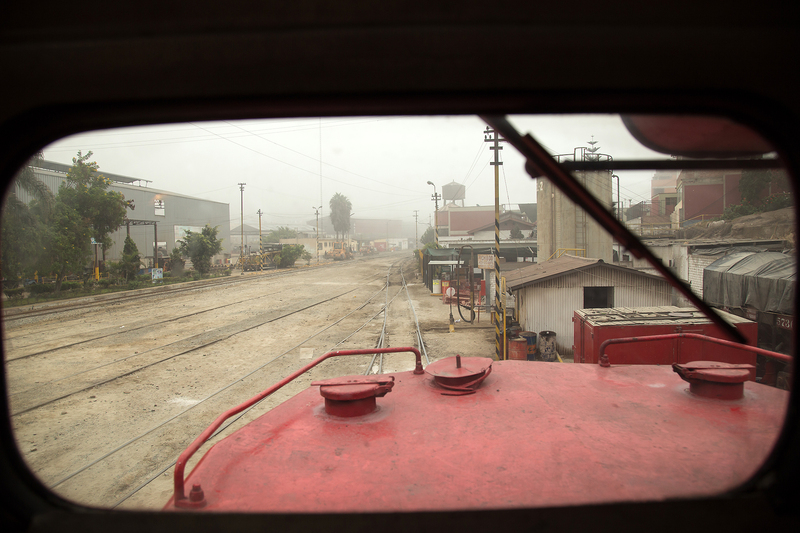 Our train rests at Matucana awaiting a downhill train. 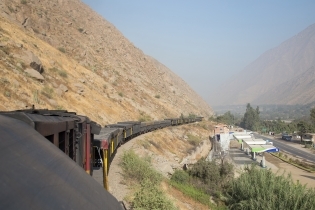 The crew has just finished setting off some cars from the rear as our train was too long to fit through the switchbacks ahead. 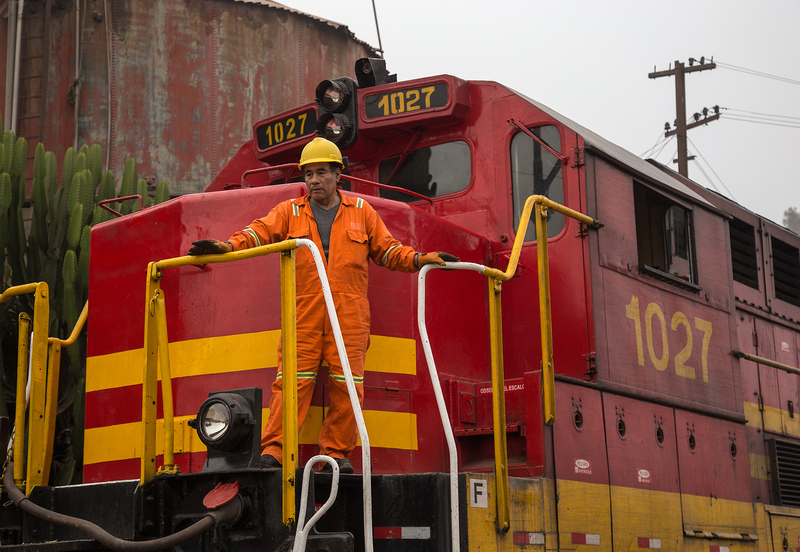 Our maquenista cleans the ditchlights of our locomotive, which will be important for all the tunnels ahead and the night run to La Oroya. 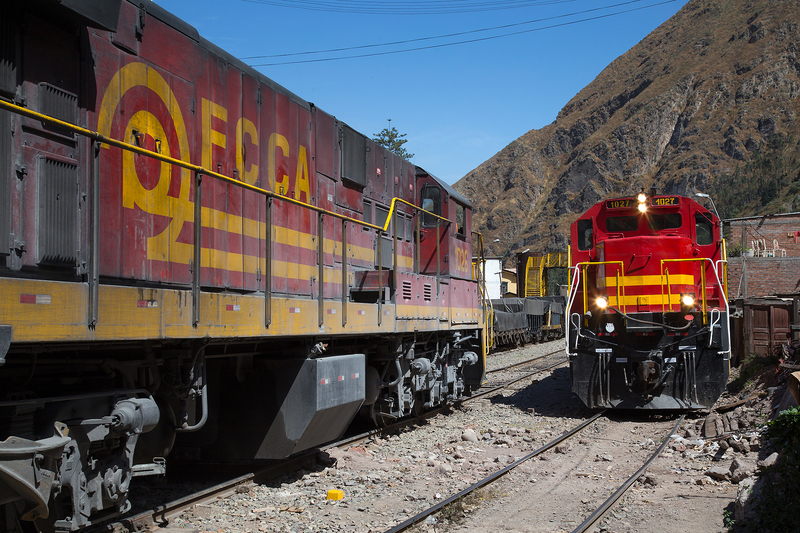 The railroaders of the FCCA take alot of pride in their operation and it shows. Sister locomotive 1026 leads the downhill train, hefe and brakero exchange greetings with the downhills crew. The FCCA is a very tight knit family and everyone knows everyone here. Consecutively numbered C39-8’s meet as the downhill train passes ours. The last car of the downhill complete with modern US style EOT passes and its time to resume our journey to Galera! 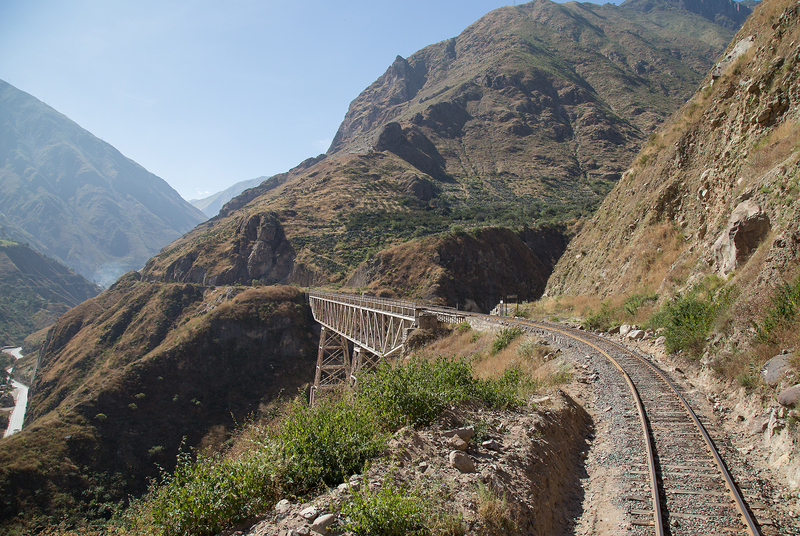 The next installment will take us over the famous switchbacks and into the heart of the Peruvian Andes in San Mateo.